The Wide-Eyed Wonder of "Shazam!" Jack Dylan Grazer as Freddie and Zachary Levi as the adult Billy in "Shazam!" The DC Extended Universe seemed to be in a lot of trouble back when Justice League came out in 2017. Just when Wonder Woman had given fans of the comic book franchise a glimmer of hope, it seemed that the studio was doomed to return to the messy and impersonal style of Zack Snyder’s Batman v. Superman. Now it seems the studio is trying its best to earn back the trust of fans by emulating the lighter tone and self-referential quality of Marvel movies, all while setting aside any ambition of creating a giant MCU–esque interconnected universe. And with Shazam!, DC has finally nailed the formula. In fact, this movie is as good as some of the best Marvel films. 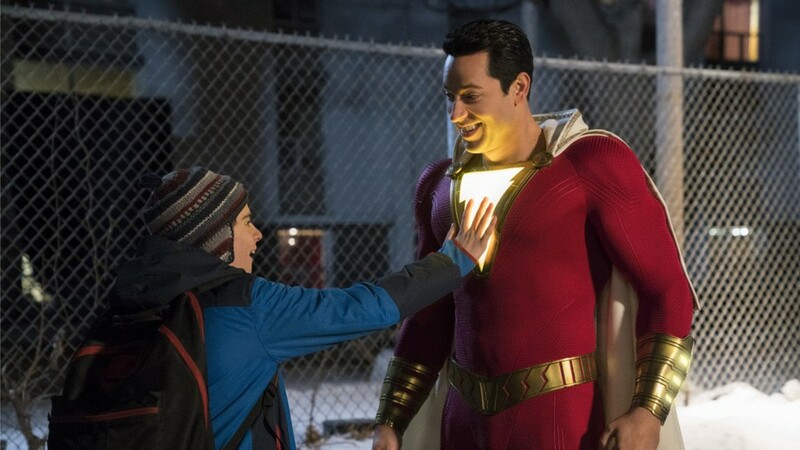 In Shazam!, Billy Batson (Asher Angel) is a rebellious foster kid who ends up with a lovable foster family after running away from his last one. He immediately befriends one of the boys in the family, Freddy Freeman (Jack Dylan Grazer of IT fame), who happens to be a devout comic-book superhero fan. When an ancient wizard gives Billy the power to transform into an adult Superman-like superhero on uttering the word “shazam,” both boys launch into an adventure in which they must fight a superpowered bad guy played by Mark Strong. This movie’s characters are its real strong point. The entire cast is exceptionally funny, including the supporting characters in Billy’s foster family. Grazer is a highlight, bringing the same energy and wit he possessed as Eddie in 2017’s IT. Especially impressive is his effortless chemistry with the almost-40 Zachary Levi, who plays the adult Billy with a childlike wonder reminiscent of Tom Hanks’s performance in Big. And, in a star-making performance, teenaged Angel as the younger Billy masterfully delivers his part in challenging adult conflicts, contrasting perfectly to Levi’s more comedic scenes. Watching the two boys explore Billy’s newfound powers is a joy. At its core, Shazam! captures the wonder and amazement which has sadly been lacking in modern superhero movies as audiences become more and more used to the genre’s tropes. It is also well written, masterfully combining the humor of newfound superhero powers and Big-esque comedy about a young boy who, in a split second, finds himself to be an adult. Shazam!, however, is certainly not an all-rounded groundbreaker. The cinematography is passable but generic, never exciting or delighting in the same way as the characters and writing. The movie’s villain is also mediocre, with Strong’s performance lacking in depth beyond generic bad-guy fare. I don’t think, however, that these aspects particularly hurt the movie, since they do not detract from the audience’s appreciation of the movie’s core elements. I strongly recommend Shazam! to family audiences and comic book fans alike. It is some of the most fun I’ve had watching a comic book–adapted movie in a while. If DC can continue to make movies with this much individuality, comedy, and wholesomeness, the future for the franchise looks strong.